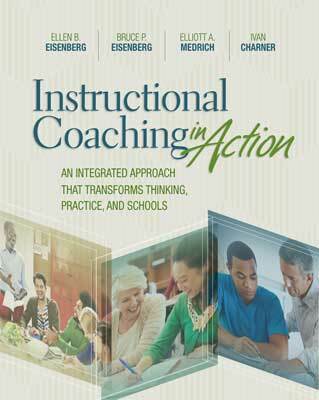 Ellen B. Eisenberg is the executive director of the Pennsylvania Institute for Instructional Coaching (PIIC). Established in 2009, PIIC is supported by the Annenberg Foundation and the Pennsylvania Department of Education. It is a statewide resource for developing and supporting the delivery of consistent, high-quality professional development around instructional coaching and mentoring. Her work involves helping school districts plan an effective instructional coaching model built on PIIC's Before/During/After cycle of consultation and the four-quadrant framework of effective core coaching elements. Eisenberg's experience with instructional coaching evolved through her 35-year teaching career and includes working with a whole-school reform model designed by Johns Hopkins University from 2000 to 2005 and her work as the executive director of the Pennsylvania High School Coaching Initiative from 2005 to 2009. Funded by the Annenberg Foundation, it was the United States' only multitiered teacher coaching initiative, providing trained teacher leaders—called coaches—to high schools across Pennsylvania. Eisenberg has authored and coauthored several articles and has presented several times locally, nationally, and internationally.